Zebra card printer solutions provide businesses enhanced security, improved quality, lower costs and better customer service. Choose from a broad range of full color or monochrome card printers. Options range from Ethernet connectivity, smart card and magnetic stripe encoding, to lamination for higher security and card durability. There is a Zebra card printer to meet all your business needs; from payment cards to driver's licenses, membership cards to employee identification badges, gift cards to ski pass IDs, and much more. Innovative, reliable retransfer card printers provide photo-like images, fast print speeds, easy integration and modular flexibility. The Zebra QuikCard ID Solution includes everything you need to quickly, easily and cost-effectively make professional-quality ID cards. 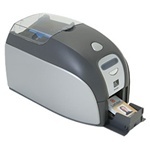 Zebra Performance class card printers offer the quality, performance, and reliability for any card printing volume. Also select from a broad set of options. With customizable security features and ability to print smart cards, Zebra’s Security class printers produce long-life cards for ID and access control. Zebra’s single-sided, single-feed P100i printer produces full-color or monochrome cards in moments. Reliable, compact and easy to use, the P110i is Zebra’s most affordable color card printer. Reliable, compact and easy to use, the P110m is Zebra’s most affordable monochrome card printer. With advanced design and solid reliability, the Zebra P120i makes dual-sided card printing more affordable than ever. Reliable. Flexible. Effortless. Zebra’s P330i card printers set new standards in this single-sided, full-color card printer loaded with user-friendly features and dynamic options, making it the most powerful and flexible printer in its class. The Zebra P430i is part of Zebra’s most popular card printer family, which has tens of thousands of printers installed worldwide. For long-lasting, tamper-resistant identification cards that are difficult to counterfeit, the Zebra P630i is your best choice. For long lasting, tamper resistant identification cards that are difficult to counterfeit, the P640i, with its revolutionary design, is your best choice. It provides reliability, ease of use, superior print quality and a low cost per card.